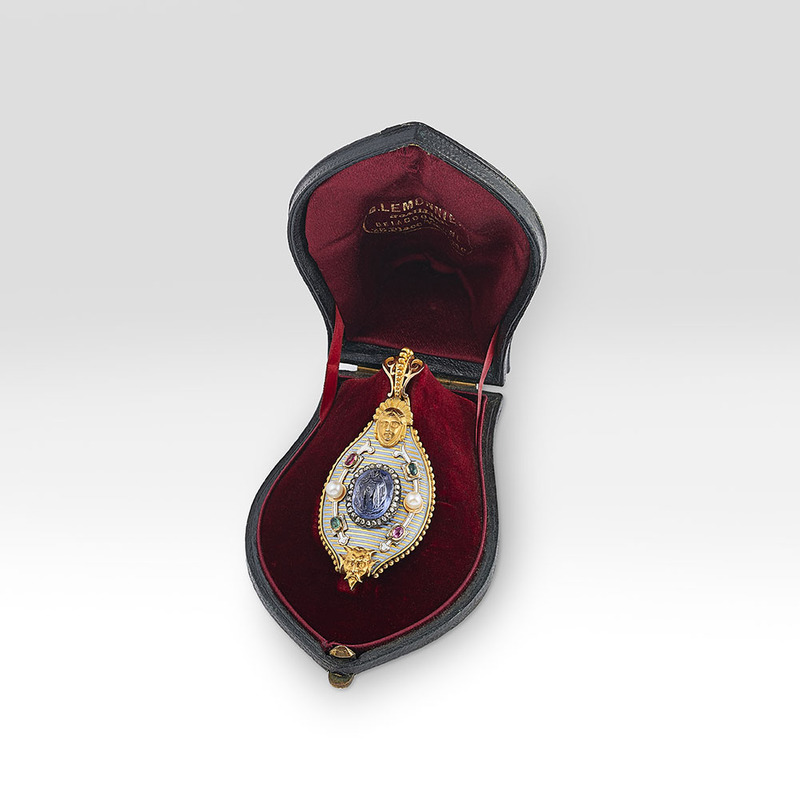 of pointed elliptical form, the surface decorated with horizontal stripes of pale blue champlevé enamel centred with a full-length representation of Mary, Star of the Sea carved from a sapphire bordered with diamonds, the brooch further decorated with alternating pearls, rubies and emeralds linked by a band of white enamel, the whole surmounted by a gold chased portrait of the Virgin with radiating crown juxtaposed with a chased gold horned devil at the base. Stamped with the early poinçon of Alexis Falize. 5.7 cm in length including loop. Contained in its original leather, red velvet and silk lined box, the satin indicating it was retailed by ‘G.Lemonnier/Joaillier/de la Couronne/25 Place Vendome’, premises which the jeweller occupied from 1853. Alexandre-Gabriel Lemmonier (1808-1884) was appointed jeweller to the Crown in 1851 and was commissioned to make lavish gem-set jewels for the wedding of Empress Eugénie to Napoleon III, continuing to supply pieces to the Imperial couple throughout their reign. Amongst other jewellers known to have supplied Lemmonier was the distinguished craftsman Oscar Massin. 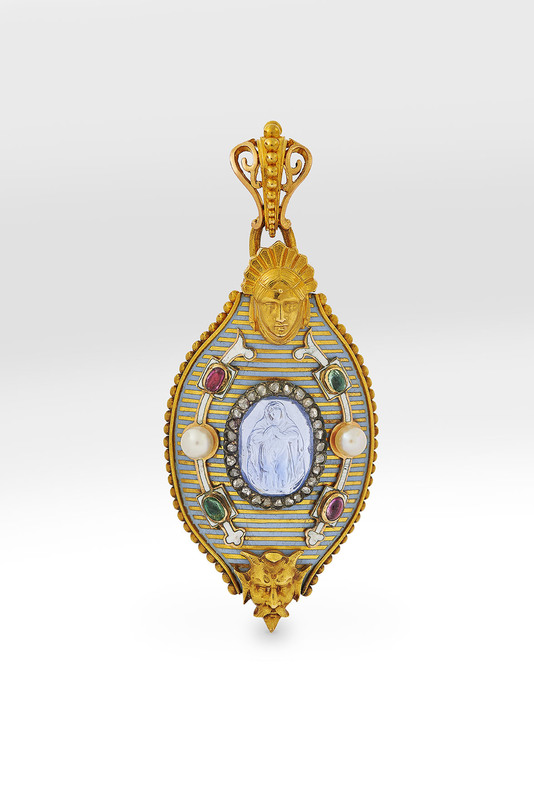 The fitted case which accompanies this pendant provides first evidence that the creations of Alexis Falize were of a standard befitting the Place Vendome. The exquisite depiction of the Virgin Mary carved from sapphire, the colour blue symbolic of devotion, is highly successfully combined with Falize’s characteristically delicate enamel work.